The HP ProLiant DL160 G6 delivers the engineering, reliability and performance excellence that has always been expected from the world’s bestselling server series. 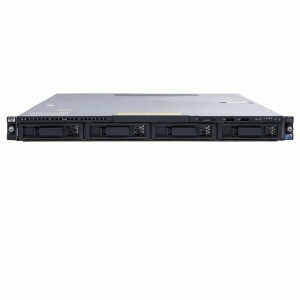 This dual socket Intel Xeon 1U server is recognised as one of the industries iconic 1U servers. For data-centre deployed applications such as VMware ESXi and Citrix XenServer virtualisation, there is no better choice. The DL160 G6 features an Intel 5520 chipset on a two-way Intel Xeon motherboard, supporting Xeon 5500/5600 series processors with up to six-cores per CPU for higher performance and better power efficiency. The DL160’s memory capacity exhibits the true scalability of this dense 1U system, with 18 DDR3 RDIMM slots supporting a maximum of 288GB when both processors are installed - providing ample scope for the most intense multi- tasking requirements and demanding applications. With all that power at your disposal, you will need a fast and reliable storage configuration to deliver data access to the same standards. The DL160 G6 delivers with 4 x 3.5” large form factor LFF SATA hard drives controlled by the onboard B110i or for SAS HDDs and RAID installations, add in the P410 HDD controller. At Bargain Hardware we understand that complex business requirements vary from one customer to the next, that’s why we allow you to build your own refurbished HP DL160 G6 to meet your specific performance or budget preferences. Use our Configure-To-Order hardware options to select your desired configuration or alternatively select from one of our special preconfigured deals when available.